Pennsylvania holds closed primary elections, meaning you must be a member of the party to vote for that party’s candidate. Primary elections in Pennsylvania are held on the third Tuesday of May in all years except Presidential years, when it is held on the fourth Tuesday of April. 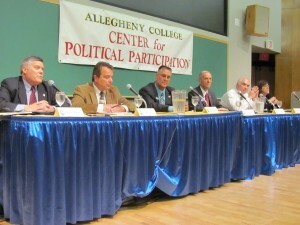 NOTE: Allegheny students are not in Meadville during non-presidential primaries. If you wish to vote, please apply for an absentee ballot or register to vote in a different county. The direct primary first emerged in Crawford County, Pennsylvania, in 1842 and was gradually adopted across the nation.